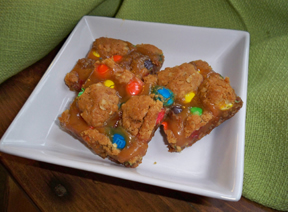 A delicious, chewy, gooey bar. Melt 3/4 cup of margarine and add oatmeal, brown sugar, flour, soda, and salt. Stir ingredients together until mixed thoroughly. Reserve approximately 1/8 of the crust mix to crumble over the top of the bars just before the final baking. Pat the rest of the crust into the bottom of an ungreased 9" x 13" baking pan. Bake the crust for 10 minutes. While the crust is baking, combine the caramels, milk and maragarine in a small saucepan. Cook over medium-low heat until caramels have melted. Stir the caramel mixture often while melting. When the crust is done, drizzle the caramel mixture over the crust. Then sprinkle the M & M's evenly over the caramel topping. Crumble the remaining crust over the top. Bake again for 15 minutes. Allow to cool and cut to desired size. Tip: Use holiday colored M & M's to produce bars with a more seasonal appearance.